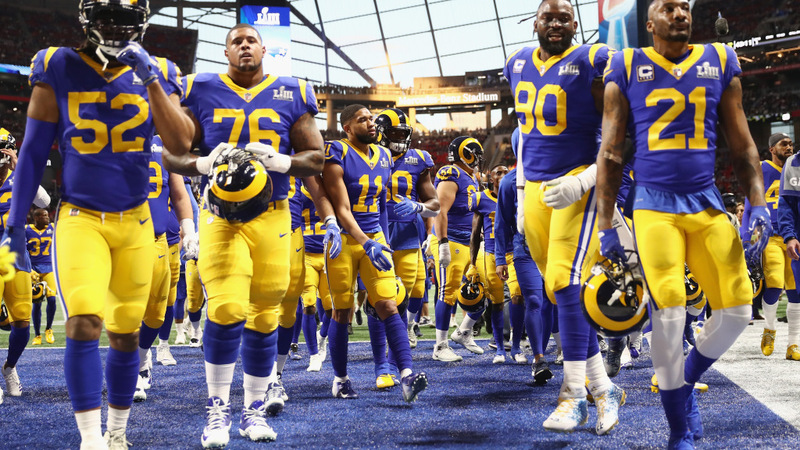 The NFL made an exception for the Los Angeles Rams last year by allowing them to wear their blue and yellow throwback uniforms as much as they’d like at home. The change remains in place until the Rams unveil their redesigned look in 2020 with the opening of the Inglewood stadium, so expect to see plenty of the throwbacks next season, too. The tweak was a welcomed one by fans everywhere, considering how widely appreciated the Rams’ blue and yellow jerseys are. It also allowed Los Angeles to do away with its hideous navy and gold uniforms, which were mismatched with the white helmets. USA TODAY recently ranked every team’s uniforms from 32 to 1 and the Rams checked in at No. 6 – a respectable position. Los Angeles Rams:Been nice seeing them retrograde to both white and yellow horns from their previous L.A. stint. For you uniform neophytes, it was the Rams who first gave us helmet logos, courtesy of former player Fred Gehrke in 1948. Let’s hope the franchise doesn’t overthink it with a change scheduled for 2020, when the new stadium opens.